It is impossible to comprehend how a person could enter a place of worship and slaughter innocent people who were simply expressing their faith, as we have just seen in Christchurch. But we can answer part of the “why”. A common thread runs through many recent mass shootings: the perpetrators are fame seekers whose acts are deliberately designed to turn them into celebrities. Whether they are seeking celebrity status for purely narcissistic purposes, or to promote extreme ideologies and become martyrs to political causes, they seek to “outdo” each other in the number of deaths they cause. More fatalities mean bigger headlines and greater infamy. Murder has become a ticket to having your name and face splashed around the world for days, weeks, even years, giving the cowardly and pathetic perpetrators a status and recognition they could never obtain in any other way. Increasingly, killers “stage manage” their atrocities. They use social media and new technologies to send their message out under their own terms, and they show chillingly accurate insight into how easily traditional media can be manipulated into giving them the sustained attention they crave. From his unthinkable livestream to his grubby “manifesto” (both of which are deliberately not linked), the perpetrator of the Christchurch atrocity does not just fit this pattern. He has owned it. Horrifyingly, he openly declared that he deliberately selected peaceful and remote New Zealand as his target and chose to use guns rather than any other methods because he believed the combination of those two things would give him maximum publicity for his vicious and bigoted views. The Christchurch shooter is Australian. Some opportunists have callously used this to push their views about Australian gun laws and snidely “tut tut” New Zealand for having a different approach. But the reality is that the shooter chose both his geography and method for a clear purpose. He knew exactly what he wanted to achieve, and how to achieve it. Worst of all, he was right. There is also something new in his hate-filled ramblings. He talks about choosing guns specifically to provoke conflict over gun laws, and foster further division and polarisation in society. We have not seen this type of sentiment before, and it raises a deeply disturbing possibility. It suggests murderers have now learned that—unlike other methods such as a truck or bomb—the use of guns provokes an immediate political reaction, arguably more so than any other feature of an incident does. This is happening right now in New Zealand, with Prime Minister Jacinda Ardern committing to immediate gun law changes. Here in Australia, all jurisdictions signed up to sweeping—and to this day contentious—changes to gun laws just twelve days after the Port Arthur massacre. 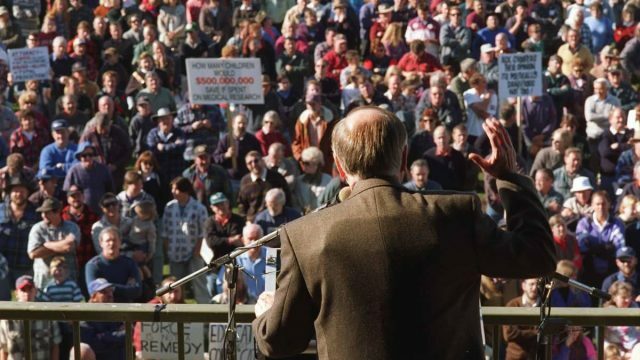 Over two decades later, we still wheel then-Prime Minister John Howard out and nod approvingly when he talks about making a virtually instant decision to ban guns, which all state and territory governments fell in behind. Commentators continue, on a regular basis, to speak in glowing terms about how the killings prompted massive, immediate government reaction on an unprecedented scale. But what if the way we talk about the Australian experience has had a terrible outcome we could not have foreseen? What if we are the country who taught the Christchurch shooter the most about the “status” that gun massacres can confer on perpetrators? Ever since Port Arthur, the way Australians have talked about how quickly our current laws happened has sent the unspoken message that when somebody commits a massacre using guns, they will also make governments dance to their tune. This is not about perpetrators having any particular beliefs on gun laws. It is about them wanting to show the world that they can directly manipulate the people who govern our society—the “powerful, important people”. It is only too easy to see how being able to control government action in this way could increase a shooter’s fantasies of grandeur, and give them a sense of influence they could never have hoped to attain otherwise. And, of course, it further fuels their publicity wagon. Australia has fallen into the disconcerting habit of equating immediate decisions with good leadership as if policymaking was a race to be won. Not only do we heap praise on officials who act instantaneously, but those who may wish to pause, reflect, look at facts, and work through issues methodically and carefully are condemned as “giving in” to lobby groups. We then wonder why Australian politics has become a game of point-scoring rather than measured discussion. Reacting has been turned into a virtue, and thinking into a vice. We have never stopped to contemplate that the pressures we place on politicians after a crime, the actions they receive approbation for, and the way we talk about gun laws, may be having dangerous unintended consequences. This does not mean that our political leaders should not take any action in the face of barbarity. Far from it. However, caution dictates that we need to much more wisely consider the timing of that action. As our dear friends across the Tasman mourn, now is Australia’s moment to start examining what role our long-running rhetoric around ‘swift action’ may play in fuelling narcissistic, murderous intent. Dr Samara McPhedran holds a PhD in Psychology and has published extensive research examining Australian and international firearm policy and gun violence. She does not work for, consult to, own shares in or receive funding from any company or organisation that might benefit from this article. Dr McPhedran has been appointed to a number of firearms advisory panels and committees, most recently as a member of the Queensland Ministerial Advisory Panel on Firearms, and as a previous member of the Commonwealth Firearms Advisory Council. She does not receive any financial remuneration or other rewards for these activities. She has held past memberships with/volunteered for a range of not-for-profit firearm-related organisations and women's advocacy groups. She is not a member of any political party. The views expressed in this article are those of the author alone.